At the time of writing, there still hasn’t been any announcement over who will get the Birmingham City manager’s job, although most of the press are now convinced it’s going to be Chris Hughton. Based on the assumption he will get the job, I suspect there will be half a zillion stories in the press tomorrow about who he’s going to hire and fire, buy and sell and what he’s having for his dinner I’m going to strike out in a different direction and look at Chris Hughton’s tactics for his former team, Newcastle United with the aid of the wonderful Chalkboards from the Guardian website. One of the first requirements that many fans have for our new manager is about attacking football; many fans want to see us play a more pass-and-move, give-and-go short game with exciting wingplay and lots of crosses into the box. In fairness, I think that’s pretty much what football is, but you get the drift; instead of playing a patient game going for it a bit. Bearing in mind the last time we got three in the league was way back in the 09/10 season against Wigan (and two of them were free kicks), it’s not implausible that fans feel goal-starved. Twice last season, Newcastle got five or more goals under Chris Hughton; winning 5-1 at home to their massive rivals Sunderland, and spanking the Villa for six without reply. 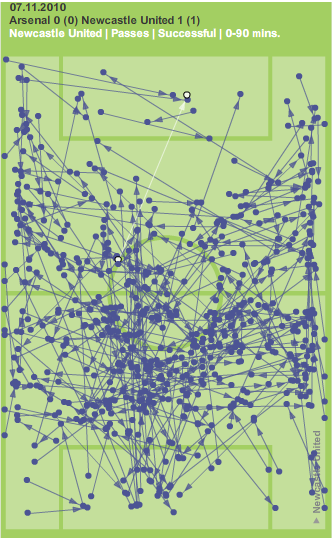 As you can see versus Sunderland, Newcastle had a lot of success down their wings; particularly the left. They were lucky in that they were blessed with two fine players on the left hand side; Jose Enrique and Jonas Gutierrez; and I hope that Chris Hughton will find have the same embarrassment of riches in the Championship with Jean Beausejour on the left and Chris Burke on the right. 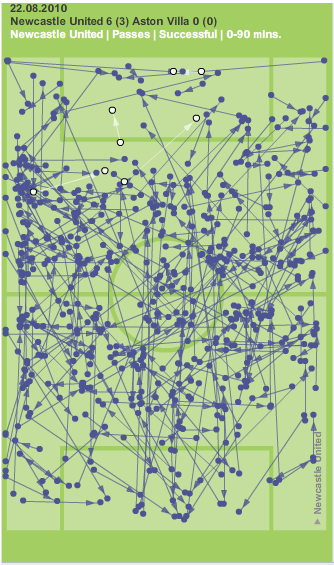 Another thing that I have noted that seems a little weird is how perpendicular the passes are; they’re either very straight sideways, parallel with the goal line, or very straight forwards, parallel with the touchline. 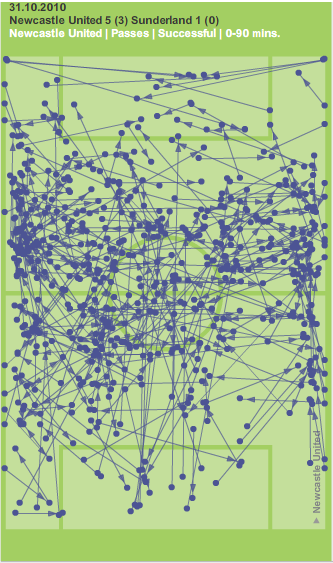 There is virtually no long diagonal balls, and not so many long passes forwards. Does this mean an end to hoofball at St Andrews? His Newcastle team aren’t just a free flowing passing machine though; they won a tough game against Arsenal with a very good performance defensively, with lots of possession retained in the middle of the park. As you can see, Newcastle had virtually no possession in and around the Arsenal box, but they kept it well in the middle third, especially in between their own box and the half way line. Too often towards the end of the season, Blues gave the ball away easily in our own half and I hope Hughton will be able to work with the midfield to ensure that they hold on to the ball much better. Of course, things didn’t always work out for him. Balance is a key issue; Toon suffered a lot when Barton was out because they had nobody else who could really hold up their right hand side; with only Burke really as an out an out winger on the right Hughton may need to look at bringing Redmond into the team; likewise there is no cover for Beausejour on the left which means I can see us bringing in another wide left midfielder, especially as I don’t believe McFadden will stay. As and when Hughton is confirmed I’ll write another piece looking at his tactical awareness and squad management skills. Hopefully it will be sorted soon so Blues can move forwards ready for the season ahead. At the time of writing, there still hasn’t been any announcement over who will get the Birmingham City manager’s job, although most of the press are now convinced it’s going to be Chris Hughton. As I suspect there will be half a zillion stories in the press tomorrow about who he’s going to hire and fire, buy and sell and what he’s having for his dinner I’m going to strike out in a different direction and look at Chris Hughton’s tactics for his former team, Newcastle United with the aid of the wonderful Chalkboards from the Guardian website. Another great piece! This will maybe allay fears that he just used Andy Carroll as a target man and hoofed balls up to him. I’m really looking forward to welcoming him to St Andrews next season. AND, its going to be played by the home team…. did i say 3yrs..??? ?………mature moment……i meant 6yrs…..
Im chuffed at the appointment of Chris Hughton. I think given time and money that he will prove to be a good manager but the board must give him time to change it all around and make his mark. I honestly believe it will be to tough to go up at the first of asking due to the possible sale of several players. Even tho we may get large amounts of money for these players but they still have to be replaced. I also hope now that he encourages the youngsters such as Jordan Mutch to come into the team cause he could have an outstanding season. As someone with a keen interest in all things tactical, I found this a fantastic and insightful read! As a toon fan living in Birmingham I must say I would be pleased to see Chris Hughton back in management. He’s a good solid manager with honesty and integrity, not something you can always say about his contemporaries. I think you’ll find it tough next year due to the number of players that have either gone or appear to be going but I wish you the best of luck. Fantastic! Maybe we could start to see some agressive, passing football at St Andrews at last. After relegation the board and fans stayed loyal to McJudas ( I personally wanted Hughton in after Fulham), he returned that loyalty by doing us a favour and departing. Let’s move on. Hope the remaining team are as positive. A very good article, and as a FA Level 2 coach, I can appreciate the tactical attributes. But I will say one thing if you looked at the passing graph of Blues Vs Arsenal in the cup final you will see a very much same image, and let me say when Blues played Villa in the 3/4 final you would see not many long passes forward but lots of small build up. I agree – the problem is it’s difficult to show how players move off the ball, etc. I’m looking at some heatmaps for next time, and other graphical analysis. So Hughton it seems to be. I must admit I had my doubts and favoured Curbishley, although I understand why the owners might not want to hire someone who has claimed constructive dismissal in the past. Well, that’s all in the past. Let’s all get behind the new guy (fans AND PLAYERS) and prepare for a successful season in the Championship (and Europe of course!). I am disappointed that Big Eck went as he did get us some silverware and we should be thankful for that. I’m not sure whether Eck didn’t play attacking football because he wanted to play defensively or we had no attackers – I know we had 8 strikers but apart from CJ there were always off sick. I think our defensive game would have been much better if a) Pav had joined last August or b) Nzog had joined at Christmas – they didn’t and we didn’t score anything either. Now that Eck has gone i would like to think it was the best option as it can’t be much fun watching poodles run around after a balloon (Championship) again! and then not have the resource to do anything decent if we do bounce back up ( not this time in my opinion). A futile future by anyone’s standards. Carsen gave us hope and Eck gave us some silver, but we will always be second division whilst we have second division money. So Carsen has to get more money (unlikely now we have flopped) or sell to a squillionaire who would like a new toy. In PL no money – no team, In fact after the top 6 teams have been considered the bottom 6 is always more interesting to see who goes down the middle teams are just survivors for the top six to beat nd get back into Europe. I am looking forward t the new manager and the tactics outlined above would be great, but we aren’t going anywhere soon without money. Even if we do we will flop again without resource!